Another easy one pan stir fry meal! Avocados are everywhere in CA right now, cheap and tasty! I've been enjoying guacamole a few times a week. Can't beat that! What goes with guacamole? Everything! 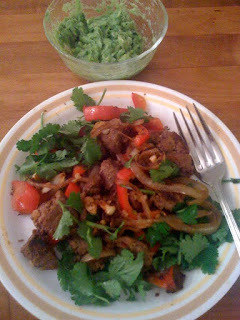 This time I made a ground bison, red pepper and onion stirfry with a little cumin. Threw a bunch of cilantro on top and ate it with a big blob of guac. Delish! Want my guacamole recipe? As I've mentioned before, there is no real recipe. Just ripe avocado, lime juice, salt, serrano or jalapeno pepper. Simple and tasty! You can also add chopped cilantro, or not. In the summertime I add sliced cherry tomatoes, and that makes it super awesome! I hate onions in my guac. NO! Hi YG/KF! I agree, no onions in guac. Love ya! Hi Mark! Hi Carrie! Thanks for leaving comments! :) Have a great day! No onions in the guac?!? Not even a baby sliver? :) And look! You had bison on the brain too. Love it. Thanks for stopping by our blog!